AND SO SHE SHOULD … INDIVIDUALS NEED TO BE ARRESTED WHO WANT TO HARASS OTHERS LIKE THIS. As reported at CNN, White House press secretary Sarah Sanders is going to receive Secret Service protection as soon as Wednesday. It is unknown as to how long she will have a protection detail. This comes on the foot-heels of Sanders being asked to leave a Virginia restaurant for the sin of working for President Trump and also the recent hostile and vile harassment of others who work in the Trump administration. Such incidents have begun a national debate on civility in American politics. The Progressive Left appears to have no shame in how they will act. With the likes of Rep. Maxine Waters fanning the flames and creating a dangerous environment, this is headed down a road that will not end well. 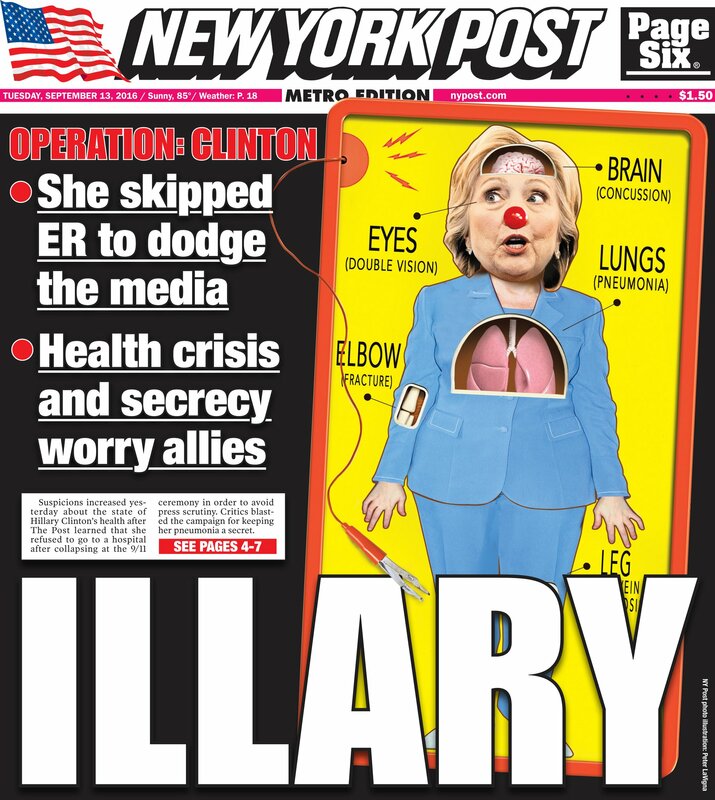 ONCE AGAIN HILLARY CLINTON AVOIDS TRANSPARENCY, THIS TIME WITH HER HEALTH … WHAT IS SHE HIDING FROM AMERICAN VOTERS? 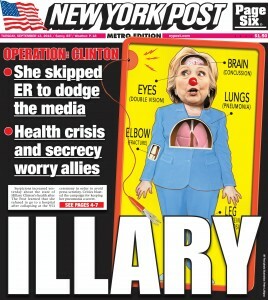 The New York Post is reporting that Hillary Clinton’s campaign went against Secret Service protocol and instead of going to a state-designated Level I Trauma Center following her collapse Sunday for medical treatment, Clinton campaign operatives change course to avoid having Hillary Clinton being seen by doctors, nurses and other medical workers who could leak details to reporters. Instead, they went to Chelsea Clinton’s NYC apartment. Really, she supposedly had pneumonia and nearly fainted and instead of going to get medical attention from professionals she went to her daughter’s apartment and played with her grandchildren. Huh? She knowingly has pneumonia that is infectious and plays with grandchildren? Please, spare us the non-sense. The truth is that she did not go to the emergency room because A. she did not want anyone but her inner circle to know what is wrong with her and B. they know exactly what is wrong with her and this has happened multiple times. The media and the American people need to demand her medical records or she be seen and evaluated by an independent doctor and the true diagnosis be revealed. Enough of this Clinton lying. For that matter, have Trump do the same. The American people are entitled to the truth of the health of a presidential candidate so that they know what they are voting for. Secret Service protocol called for the Democratic presidential nominee to be rushed to a state-designated Level I Trauma Center in the wake of her Sunday-morning health crisis, sources said. In Manhattan, that would be Bellevue Hospital. A NOTE TO ALL MORONS … DON’T EVEN THINK OF THREATENING TO BOMB A PRESIDENTIAL RALLY. A FURTHER NOTE TO THE SOCIAL MEDIA GENERATION, ACTIONS HAVE CONSEQUENCES. A 20-year-old man is in custody after threatening to bomb Saturday’s rally for Republican presidential candidate Donald Trump in Waterbury. At about 12:45 p.m., the United States Secret Service contacted the Connecticut State Police after seeing a threat posted on Twitter threatening to “bomb” the rally for Trump. A second Twitter post warned the suspect’s friend to have his family members leave the rally so they wouldn’t be hurt. Detectives found that the Twitter posts came from the area of Ardsley Road in Waterbury from the account of Sean Taylor Morkys. WHAT THE HELL HAS HAPPENED TO THIS ONCE PROUD, RESPECTED AND REVERED AGENCY? Two senior Secret Service agents are being investigated for allegedly driving an agency vehicle while under the influence of alcohol. One agent was identified as Mark Connolly, the second-in-command on President Obama’s protective detail and the other is George Ogilvie, a senior supervisor in the Washington field office. Both agents have been reassigned to desk jobs and stripped of management roles while the Department of Homeland Security’s Office of Inspector General investigates. How were these Secret Service agents not arrested on the spot, but were instead given professional courtesy. Pathetic, this entire Obama government is just a colossal, unorganized, undisciplined, mitigated disaster. Another possible case of misconduct involving the Secret Service is under investigation, CBS News has learned. Sources familiar with the investigation tell CBS News two senior Secret Service agents are being investigated for allegedly driving an agency vehicle while under the influence of alcohol. The incident happened after 11 p.m. on Wednesday, March 4. At the same time, the Secret Service was investigating a suspicious package near the White House grounds which turned out to be harmless. The agents were returning from a retirement party for outgoing Secret Service spokesman Ed Donovan when they allegedly drove through a line of yellow plastic security tape placed around the scene and hit a barrier. One agent was identified as Mark Connolly, the second-in-command on President Obama’s protective detail. The other is George Ogilvie, a senior supervisor in the Washington field office.